You’re entering the realm of extreme Bermuda Water Sports and you ‘Adrenaline Junkies’ can now get your fix! The Seabreacher is one of the most advanced semi-submersible watercraft in the market today. It combines the most eloquent aspects of hydrodynamics, marine bio-mimicry, and extreme power boating to deliver a machine that visually appears like a shark, moves like an exotic sports car and feels like maneuvering a fighter jet aircraft. The Seabreacher steps up the performance envelope with a 300hp supercharged engine. All this power enables the vessel to reach a top speed of up to 65 mph on the surface and 30 mph below the surface. When you breach the surface during these high-speed dives you can launch 18 feet out of the water. 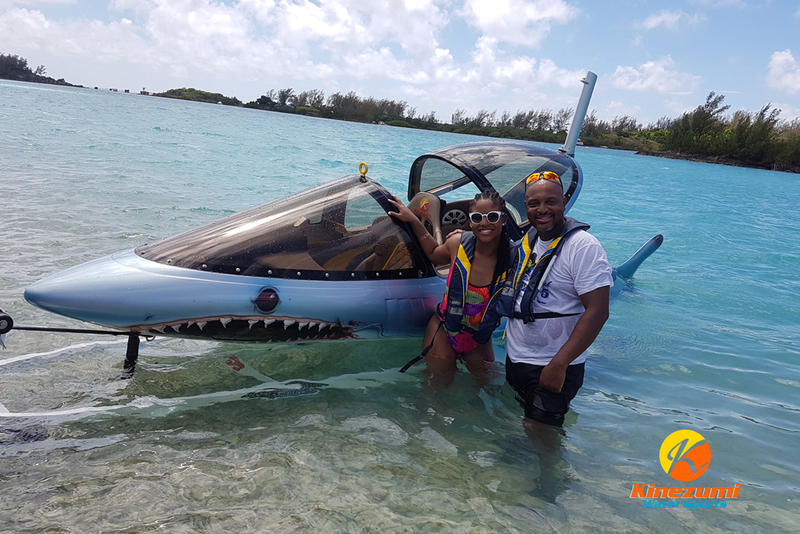 Operating from the beautiful blue crystalline waters of Bermuda, we will take you on an adrenaline packed ride. Sit back in our state of the art cockpit and get ready to feel the g-forces as our skilled pilots give you an experience you will not forget. Dive 3-5 feet under water.Jump 18 feet out of the water.65 MPH across the water (surface).Turn tight doughnuts and 90′ angle side rolls. Looking through the F-16 fighter-grade glass you will see the sky disappear as your driver descends into a dive only to then breach the surface and launch the entire vessel in the air. Tight turns and top speeds all at a low center of gravity and this trip will certainly get your heart pumping. Did you ever dream as a child of riding your bike above the skies like E.T.? 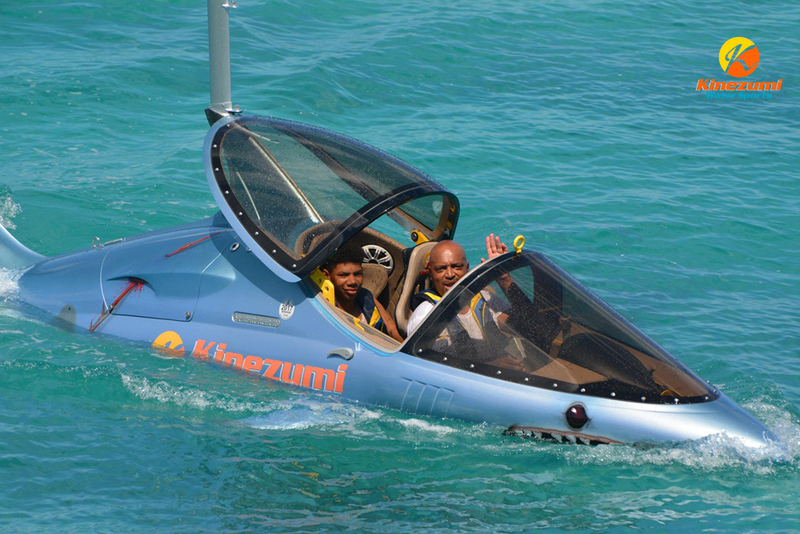 The Jetovator is the new ‘bike’ to be ridden above the crystal clear waters of Bermuda. The Jetovator is a water sports accessory that extends the ability of an existing jet ski and redirects the water thrust from the jet unit of the jet ski along a 40-60 foot hose to the Jetovator body. This water thrust is then used to propel and elevate the Jetovator into the air. The rider can also redirect the water thrust of the two front nozzles in order to maneuver the Jetovator in all directions. It’s like defying gravity by balancing on a water bike powered by jet skis. All this is done safely as a Certified Jetovator Instructor follows behind the Jetovator on the jet ski, using the hose as a tether. You can take the Jetovator through the air in comfort for long distances. Or, for skilled riders, you can dive under water for brief durations and perform freestyle tricks. Don’t worry if it’s your first time, if you can’t swim or if you’ve never ridden a bike. Jetovators are incredibly easy to ride. Our certified Jetovator Flight Crew will teach you all of the basics and have you flying the Jetovator like a pro in no time! We are also happy to offer you our tandem Jetovator which can sit 2 riders. If you have a child that is too young or too afraid to ride the Jetovator on their own, then s/he can ride the Jetovator with one of our certified instructors at the controls. Or if you and a friend wish to experience the thrill of hydro flight together, then the tandem Jetovator is for you!